Everybody loves toys. Have you ever thought of building your own toy? For example, a mouse trap car. It is often used as a science project assignment for education purposes other than for car competition wise. Either way, it is not a difficult task to setup one on your own. In fact, with the right tools and materials, you can have one up and running down your hallway in just a few hours time. 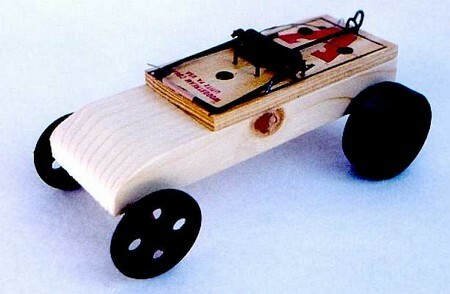 You can try it out yourself today by following the simple steps on how to build a mouse trap car suggested below. Firstly, get a new mouse trap and look for the wire which holds the opening of the mouse trap. Take extra care when meddling with the trap. Then, use pliers to remove the wire and the bait holder from the trap. You will need two eye screws to create holes at the end of the mouse trap. Do take note that these holes should be made 8mm from the edge before you screw them right into the holes. Now, you can focus on making the wheels of the car. To make the shape of the wheels, you can draw four circles measuring 75mm each on the plywood with the help of a compass. In actual fact, the circle size can varies based on your own preference. After you have cut the circles out using a saw, ensure that the wheels are made smooth by filing. Take hold of two metal rods where you will cut them into equal length and proceed with using a file to make their edges smooth. You will first need a rod where you make a cut halfway into it. Place the wire of the trap which you have removed earlier on into the slot you have created. Secure the wire on the axle’s slot with some glue and leave it to dry for one night. Next, fix the rod onto the end of the trap where the eye screws have been put in place in the earlier phase. Do the same with the other rod too. Use washers to hold the axles together. Take each ready cut wheel and drill a hole in the middle. Slide all four wheels on each side of the rods. Lastly, for the car’s engine, you will need a string to tie it to the center of the mouse trap’s jaws. Make a loop for the end to reach to the trap’s rear axle. Glue two rubber bands together around the back of the wheels. Finally, you are ready for a mouse trap car race. For further improvement or enhancement on your car, it is advisable to experiment with various wheel sizes and additional features for a more aerodynamic design. Flaunt your car down the race track by throwing in colorful paints or marker on your car wheels.